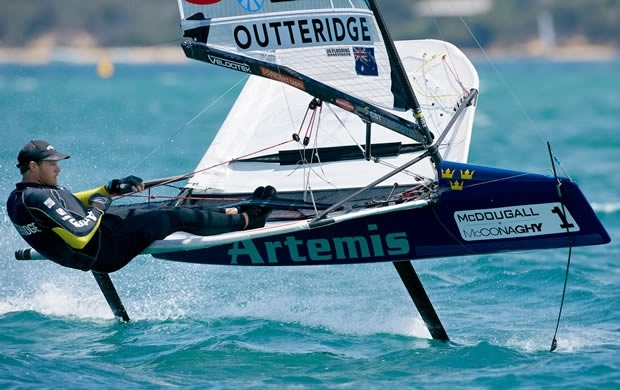 New Zealand’s Peter Burling reeled off four straight wins to take the lead on day two of the McDougall + McConaghy 2015 International Moth World Championship on Port Phillip in Sorrento, Victoria, sounding the warning bell for the other 159 competitors. Ashore Burling said: “I won all four races – the last one by over a lap, which is pretty pleasing in this fleet. it’s all come together here,” he said referring to his disappointing results at the Worlds in 2011 and 2013. “I did well in the light and shifty weather yesterday and today was as good. I put a lot of work into improving my game for this event." “We were in flatter more manageable water than the Yellow fleet, but even so, I dropped off the foil at one stage and fell back to 11th, but I still got back and won. Everyone had a swim, or crashed or overtook,” the 2012 Olympic 49er silver medallist said of the course which was closer to the Sorrento Sailing Couta Boat Club, host for the event. He named Chris Rashley and Chris Draper from Great Britain and Australians Tom Slingsby, Iain ‘Goobs’ Jensen, Josh McKnight and Scott Babbage as other threats. For his part, Outteridge said of Burling: “I’ll face him tomorrow, because qualifying is over and we’ll be in the Gold fleet. I beat him on the first day in light air – that’s what I’m best at, but tomorrow’s meant to be even windier than today… I’ll be okay, but I prefer the light. Babbage is tucked into third place overall, a win in Race 6 giving him the jump on Outteridge’s 49er crew and fellow Artemis Racing team member, Iain Jensen, who sailed in the Blue fleet and is fourth overall after, “three good races, but I broke a bunch of stuff in the fourth… It was bumpy, crazy and full-on in the last two races,” he said. Racing will get underway from 1300 hours tomorrow.